SPOOKED TELEVISION NEWS: By popular demand - third night added, October 31, Booth Brothers at the haunted Ashmore Estates Poor Farm in Illinois. 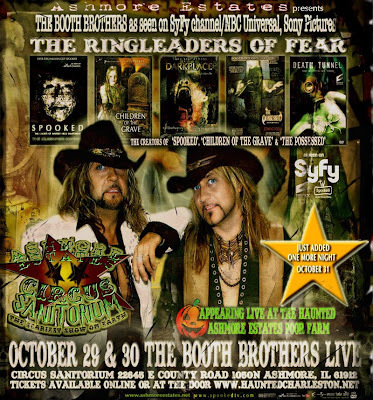 By popular demand - third night added, October 31, Booth Brothers at the haunted Ashmore Estates Poor Farm in Illinois. You can catch the latest Booth Brothers shows this 31 days of Halloween on the SyFy Channel. Please check your local TV listings for channel and show times info. NEW SyFy Dates Just added.